I’m a baby-head. And my ideas are poopy-headed. So says (or yells) my 5-year-old son, anyway. It’s hard to keep a straight face when he’s having a tantrum and throwing out this type of insult, even though on the inside my heart is breaking a little because he’s so obviously frustrated and doesn’t know how to cope. So for now, angry outbursts in our house are going to be accompanied by some creative and sometimes pretty hilarious insults. My husband and I will try to hide our smiles while we show respect for his feelings, set limits on his behavior, help him learn coping strategies, and otherwise do all the “good parent” things we’re supposed to be doing. And we’ll wait until later, after he’s in bed, to laugh hysterically about his word choices; after all, that may turn out to be the one bright spot in an otherwise very trying day as parents. 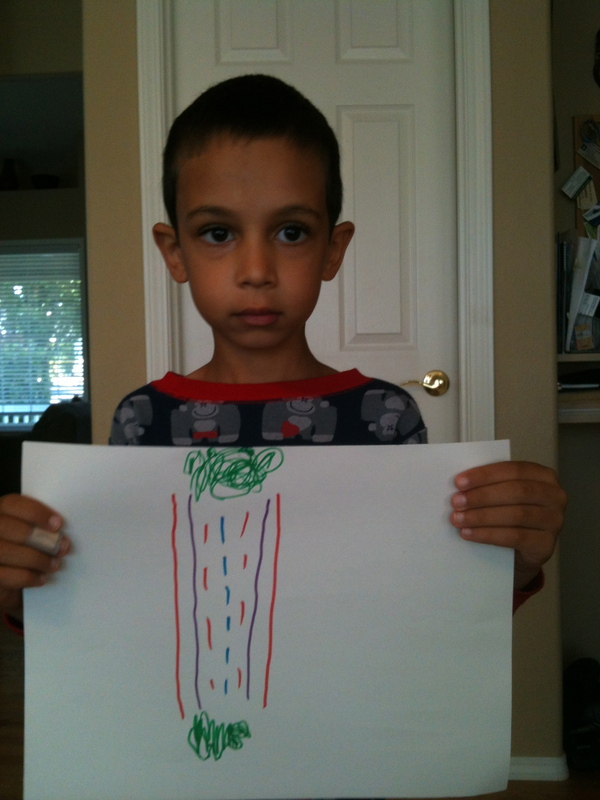 A picture of “Angry.” Drawing his feelings actually turned out to be a pretty good alternative to yelling about them!